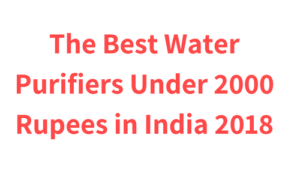 If you are on the budget and looking for best water purifiers under 2000 rupees then I must say you are at the right place. 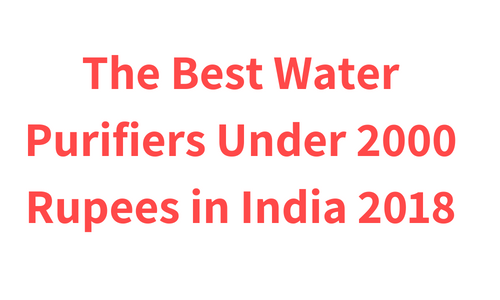 Because in this article I have reviewed the best water purifiers you can buy under 2000 rupees. You will get to know all the specifications and pros and cons of these water purifiers. So without wasting any time that’s begin the list. If you are looking for an effective water purifier with elegant looks and fast purification process then Eureka Forbes Aquasure Amrit 20 l gravity based water purifier is ideal for you. This water purifier comes with a 3-stage water purification system which is very effective in purifying low TDS water like Municipal water. This water purifier is made from Food grade plastic which is non toxic. This water purifier has a very good looking elegant design and transparent water storage tank which gives you idea about how much water is remained in it. The water storage tank also has markings on it which is very helpful. This water purifier comes with an auto shut off features which is also called as Natural shut off feature. It basically stops the water flow once the purification power of the cartridge gets over ensuring that you get safe drinking water every time. It’s cartridge has life of purifying 750 litres of water, after that you have to change its cartridge for continuous purified water flow. The first stage of purification has particulate filter which removes visible impurities like sand, dirt, mud from the water making it clear. The second stage of purification has sediment filter which removes invisible impurities from the water. The third stage of purification has a kitanu magnet which is basically a combination of two water purification filters. This water purifier does not uses any kind of chemicals like chlorine for the purification of water, ensuring that you get 100% chemical free water. The 3-stage purification along with kitanu magnet Eureka Forbes Aquasure 20 l Amrit gravity based water purifier has a good solution for purification of low TDS water like municipal water. As the name suggests this water purifier comes with a water storage tank of 20 litre, which is divided into two compartments, the upper compartment and the lower compartment. Both the compartments are transparent and have markings on it. You have to pour water in the upper compartment and the purified water get stored in the lower compartment. The markings on the water storage tank gives you idea about how much water you should pour in the upper compartment so that it will not cause water overflow. It takes around 1 hour to fill the purified water storage tank fully, which is quite fast comparing to other gravity based water purifiers. Users like this water purifier for its good looks. They also found the markings on the water purifier quite helpful. They also appreciated it’s easy assembling. This water purifier comes with a push-back lever to dispense the water. If you push the Lever down it will dispense the water very slowly so you have to pull the water liver up for fast dispensing of water. Some users also find the body of this water purifier quite delicate so you have to handle this water purifier with care. If you are looking for a water purifier with good looks and transparent water storage tank with markings and fast water purification process then Eureka Forbes Aquasure Amrit 20 l gravity based water purifier is ideal for you. This water purifier comes with a 3-stage water purification Technology along with kitanu magnet which is very effective in purification of low TDS water like Municipal water. Also it takes very less time for the purification of water. It only takes around an hour for the purification of 9 litre water. Moving to its cons this water purifier has a delicate body so you have to handle it with care. If you are looking for a gravity based water purifier with advanced water purification system then Tata Swach Cristella Plus is ideal for you. This water purifier comes with Tata Swach bulb and MF membrane which are very effective in purifying low TDS water like Municipal water. This water purifier has a scratch resistant sturdy body. It has a water storage tanks which is divided into two compartments. Both the compartments are transparent and they have markings on it for the water level indication. It also comes with a high quality two way dispenser tap. This water purifier is very easy to assemble and clean. This water purifier comes with water storage tank of 18 litres which is divided into two compartments. Each compartment is of 9 litres. Both the compartments are transparent and have markings on it for water level indication. You have to pour water in upper compartment and the purified water gets stored in the lower compartment. It takes about 1:30 to 2 hrs to purify 9 litres of water. If the lower compartment which is the purified water storage compartment is full and you pour Water in the upper compartment then it will cause water overflow from the middle. The markings on the water storage tanks comes into play when the purified water storage compartment is somewhat empty and you want to pour the water in the upper compartment so that it will not cause water overflow. Tata Swach Cristella Plus water purifier comes with an effective 3-stage water purification system. The first stage of purification has Top Mesh, which removes Sand, Dust, mud and other visible suspended particles from the water making it clean and clear. The second stage of purification has Tata Swach bulb which removes harmful microorganisms from the water and it also comes with some advanced features like Swach bulb lock and Tata Swach bulb fuse. The Tata Swach bulb fuse indicates you how much purification power is remained in Tata Swach bulb and gives you basic idea when you should change it. It also has automatic mechanism which basically shuts down the water flow once the power of purification of the Tata Swach bulb gets over ensuring that you get purified water every time. The third and the final stage of purification has MF membrane. The MF membrane has very tiny pores which allows water molecules only to pass through it and block harmful contaminants such as bacteria, viruses, Protozoa, Fungi, algae, rust and cysts from the water making it safe for drinking. With 3 stage purification and Tata Swach bulb, Tata Swach Cristella Plus water purifier has a very good solution for the purification of low TDS water like Municipal water. Users like this water purifier for its easy assembling and cleaning. They are also happy with the working of this water purifier. It all comes in with a very affordable price tag. This water purifier has a loose upper lid also the plastic quality is not so good. This water purifier also does not have the activated carbon filter which we generally see in other gravity based water purifier. If you are looking for a gravity based water purifier with advanced multistage water purification system which gives you confidence that you are drinking a safe water then Tata Swach Cristella Plus water purifier is ideal for you. This water purifier comes with a multistage water purification system with Tata Swach bulb, which has some advanced features like Tata Swach lock and Tata Swach Bulb fuse. It also comes with MF membrane which makes it very effective in the purification of low TDS water like Municipal water. The upper lid of this water purifier is somewhat loose and the plastic used in the construction is also not of a good quality. It also does not comes with activated carbon filter which we generally see in other gravity based water purifiers. If you are looking for a robust water purifier with UF water purification Technology then Kent Gold Optima 10 l gravity based water purifier is ideal for you. It comes with UF membrane and activated carbon filter which is a good solution for the purification of low TDS water light Municipal water. This is a table top water purifier and comes with a water storage tank which is transparent. Along with robust construction this water purifier comes with Spin Welded UF membrane, which has tiny pores of 0.1 Micron which allows water molecules only to pass through it and blocks bacteria and cysts, ensuring you get safe water for drinking. Municipal water is generally treated with chlorine for the purification which forms harmful chlorine by-products in the water. This water purifier comes with activated carbon filter which absorbs such harmful chlorine by-products and bad taste and odour causing come contaminants as well. Activated carbon filter and the UF membrane removes harmful contaminants from the water making it safe for drinking. This water purifier also comes with water storage tank of 10 litres. It is divided into two Compartment is compartment is of 5 litres. It takes about 30 to 45 minutes to purifier 9 litres of water that is to fill its lower purified water compartment. Users like this water purifier for its tough and study body and high quality construction. They are also happy with its working. The best part about this water purifier is that it will not cause any kind of water overflow, unlike some of the other gravity based water purifiers, if you pour water in the upper compartment even when the lower purified water compartment is full. Some users also experiences low water purification from this water purifier. This water purifier comes with a syringe which you should use frequently for the fast water purification process. If you are looking for a study and tough UF water purifier then Kent Gold Optima 10 litre water purifier is ideal for you. This water purifier comes with an activated carbon filter and an UF membrane which is very effective in the purification of low TDS water like Municipal water. It will not cause any kind of water overflow unlike other gravity based water purifier, if you pour water in the upper compartment even if the lower purified water storage compartment is full, which is quite convenient. Coming to its cons this water purifier has relatively smaller water storage tank. If you are looking for a gravity based water purifier with a good water purification system and wall mountable feature then Livpure Brahma Neo gravity water purifier is ideal for you. Livpure Brahma neo is a wall mountable water purifier and you can also use it as a tabletop as well. As like most of the gravity based water purifiers the body of this water purifier is divided into two compartment i.e. the upper compartment and lower compartment. The body is transparent so you will get an idea about the water levels in the both compartments. It comes with normal water dispensing tap. You have to pull the dispensing tap lever to dispense the water and it will automatically regain its original position once you release the liver. Livpure Brahma Neo comes with 4 stage water purification system. Now let’s have a closer look at each stage of water purification, its filter and its working. This purification stage have multi-layered depth filter which is made from food grade and non biodegradable polypropylene fibre. It removes physical or visible particulate impurities from the water. This filter is made from multiple layers of non woven polypropylene fibre. As the name suggests, this filter removes sediments from the water. It also works as a protective layer for pump booster head and solenoid valve by removing sediment decomposition. It removes harmful impurities such as herbicides, pesticides, insecticides, weedicides etc. It also removes microorganisms such as bacteria, harmful microbes and viruses. The Kitanu Guard is USIFA registered and it has the capacity to purify 2000 litres of water at room temperature. The main purpose of Kitanu Guard is to remove bacterial and viral and other microbial disinfectant. With 4 stage water purification having pretty good water filters Livpure Brahma Neo gravity water purifier has a pretty good water purification system, considering it is a gravity based water purifier. The filter life of all the filters except Kitanu Guard is 4000 litres. So you will have to change these filters after every four thousand litres of water purification. The purification life of Kitanu Guard is 2000 litres so you will have to change the Kitanu Guard after every 2000 litres of water purification. This water purifier generally purifiers 12 litres of water in an hour but the water purification time is really depends upon the quality of the water and also the filter life of the water purifier i.e. if the filters are pretty old then it will take a lot more time for water purification than when they are new. Livpure Brahma Neo comes with 16 litre water storage tank. The water storage tank is divided into two similar compartment i.e. upper compartment and lower compartment. If you are looking for a gravity based water purifier with good water purification system and wall mountable feature and Livpure Brahma Neo is ideal for you. This water purifier comes with 16 litre water storage tank. Overall this water purifier is ideal if you are using water from municipal water supply. So these are the best water purifiers under 2000 rupees. I hope you will find this list helpful. Let me know if you have any questions in the comments section below.